* Includes impact of the MVNO Transaction completed September 1, 2016. **Adjusted EBITDA is a non-GAAP financial measure and should be considered in addition to, but not as a substitute for, the information provided in accordance with GAAP. Reconciliations for the non-GAAP financial measures to the most directly comparable GAAP financial measures are provided in the financial tables. *** Calculated as Adjusted EBITDA divided by service revenues. **** T-Mobile is not able to forecast net income on a forward looking basis without unreasonable efforts due to the high variability and difficulty in predicting certain items that affect GAAP net income including, but not limited to, income tax expense, stock based compensation expense, interest expense and interest income. BELLEVUE, Wash. - October 24, 2016 - T-Mobile US, Inc. (NASDAQ: TMUS) today reported third quarter 2016 results which again showed that superior customer metrics are driving industry-leading financial results. In the third quarter of 2016, T-Mobile added 2.0 million total net customers while delivering 13% year-over-year growth in service revenue, $366 million in Net Income, and $2.6 billion in Adjusted EBITDA. "That’s 14 quarters in a row that T-Mobile has won share from the competition,” said John Legere, President and CEO of T-Mobile. “The Un-carrier is delivering. We took share and grew our customer base while producing both financial growth and shareholder value. Most importantly, we are delivering results for both customers and shareholders alike." T-Mobile expects to lead the industry in branded postpaid phone net additions for the 11 th consecutive quarter. The Company saw continued growth in branded postpaid phone customers with net additions of 851,000 in the third quarter of 2016. The increase was primarily due to the introduction of the T-Mobile ONE plans, the launch of the iPhone 7 in the quarter and an increase in branded prepaid customer migrations to postpaid plans. Branded postpaid net customer additions were 969,000 in the third quarter of 2016. In addition to strong customer growth, T-Mobile delivered outstanding financial results in the third quarter of 2016 and expects to once again lead the industry in year-over-year percentage growth in service revenue and total revenue. Service revenues for the third quarter of 2016 grew by 13% year-over-year, primarily due to continued growth in T-Mobile’s customer base. This is expected to mark the tenth consecutive quarter that T-Mobile has led the industry in year-over-year service revenue percentage growth. T-Mobile’s total revenues for the third quarter of 2016 grew by 18% year-over-year, which is also expected to lead the industry for the thirteenth time in the past fourteen quarters. Branded postpaid phone Average Revenue per User (ARPU) of $48.15 in the third quarter of 2016 was up 2.2% sequentially and generally stable year-over-year. Excluding the impact of Data Stash, branded postpaid phone ARPU was up 1.6% sequentially as the impact of the T-Mobile ONE rate plans and the MVNO Transaction more than offset continued strategic focus on family plan penetration and promotional activity. Excluding the impact of Data Stash, branded postpaid phone ARPU was up 1.5% year-over-year due primarily to growth in insurance plans, higher data attach rates and the MVNO Transaction, partially offset by the family plan penetration and promotional activity. Branded postpaid Average Billings per User (ABPU) was $63.38 in the third quarter of 2016. Excluding the impact of Data Stash, branded postpaid ABPU was up 0.8% sequentially and 1.5% year-over-year. Branded postpaid customers per account grew to 2.78 in the third quarter of 2016, up from 2.64 in the second quarter of 2016 and 2.48 in the third quarter of 2015. The sequential increase was primarily due to the MVNO Transaction and the year-over-year increase was primarily due to ongoing service promotions targeting families, increased penetration of mobile broadband devices and the MVNO Transaction. Net income was $366 million, up from $225 million in the second quarter of 2016 and up from $138 million in the third quarter of 2015. Net income in the third quarter of 2016 included after-tax spectrum gains of $122 million. Earnings per share (EPS) in the third quarter of 2016 was $0.42, compared to EPS of $0.25 in the second quarter of 2016 and $0.15 in the third quarter of 2015. The after-tax impact of spectrum gains on EPS in the third quarter of 2016 was $0.15. The year-over-year increases in net income and EPS resulted primarily from higher service and equipment revenues due to growth in the customer base and the spectrum gains, partially offset by higher operating and non-operating expenses. The increase in operating expenses resulted from a rise in cost of equipment due to an increase in devices sold and average cost per device, increased SG&A expense due to strategic investments to support growing the customer base, and higher D&A expense related to leased devices and the build-out of the LTE network. The increase in non-operating expenses was due primarily to higher income tax and interest expense. Net income as a percentage of service revenues was 5.1% in the third quarter of 2016 compared to 2.2% in the third quarter of 2015. In the third quarter of 2016, Adjusted EBITDA increased by 38% year-over-year to $2.630 billion. Adjusted EBITDA in the third quarter of 2016 included spectrum gains of $199 million. The year-over-year increase was primarily due to higher service revenues from growth in the customer base, spectrum gains and synergies realized from the MetroPCS business combination, partially offset by higher SG&A expenses due to strategic investments to support growing the customer base. Adjusted EBITDA margin was 37% for the third quarter of 2016 compared to 30% in the prior year. Excluding the spectrum gains, Adjusted EBITDA margin was 34% for the third quarter of 2016 compared to 30% in the prior year. Adjusted EBITDA margin is calculated as Adjusted EBITDA divided by service revenues. The aggregate net impact from leasing and Data Stash on Adjusted EBITDA in the third quarter of 2016 was $294 million, including lease revenues of $353 million offset by the non-cash impact from Data Stash of $59 million. Net cash provided by operating activities was $1.7 billion in the third quarter of 2016, up from $1.5 billion in the third quarter of 2015. Free cash flow was $581 million in the third quarter of 2016, compared to $411 million in the third quarter of 2015. Adjusted free cash flow was $624 million in the third quarter of 2016 compared to $487 million in the third quarter of 2015. Branded postpaid net customer additions for the full-year 2016 are now expected to be between 3.7 and 3.9 million, an increase from the previous guidance range of 3.4 to 3.8 million. T-Mobile is not able to forecast net income on a forward looking basis without unreasonable efforts due to the high variability and difficulty in predicting certain items that affect GAAP net income including, but not limited to, income tax expense, stock based compensation expense, interest expense and interest income. For the full-year 2016, T-Mobile now expects Adjusted EBITDA to be in the range of $10.2 to $10.4 billion, raising and narrowing the previous guidance range of $9.8 to $10.1 billion. This guidance includes the aggregate net impact from leasing and Data Stash, now expected to be approximately $1.0 to $1.1 billion, and $0.8 billion related to spectrum gains recognized in the first nine months of 2016. Cash capital expenditures for the full-year 2016 are expected to be in the range of $4.5 to $4.7 billion, narrowing the previous guidance range of $4.5 to $4.8 billion. For more details on T-Mobile’s third quarter 2016 financial results, including the Investor Factbook with detailed financial tables and reconciliations of certain historical non-GAAP measures disclosed in this release to the most comparable measures under GAAP, please visit T-Mobile US, Inc.'s Investor Relations website at http://investor.T-Mobile.com. Investors and others should note that the Company announces material financial and operational information to its investors using its investor relations website, press releases, SEC filings and public conference calls and webcasts. The Company also intends to use the @TMobileIR Twitter account ( https://twitter.com/TMobileIR) and the @JohnLegere Twitter ( https://twitter.com/JohnLegere), Facebook and Periscope accounts, which Mr. Legere also uses as a means for personal communications and observations, as means of disclosing information about the Company and its services and for complying with its disclosure obligations under Regulation FD. The information we post through these social media channels may be deemed material. Accordingly, investors should monitor these social media channels in addition to following the Company’s press releases, SEC filings and public conference calls and webcasts. The social media channels that the Company intends to use as a means of disclosing the information described above may be updated from time to time as listed on the Company’s investor relations website. As America's Un-carrier, T-Mobile US, Inc. (NASDAQ: TMUS) is redefining the way consumers and businesses buy wireless services through leading product and service innovation. The Company's advanced nationwide 4G LTE network delivers outstanding wireless experiences to 69.4 million customers who are unwilling to compromise on quality and value. Based in Bellevue, Washington, T-Mobile US provides services through its subsidiaries and operates its flagship brands, T-Mobile and MetroPCS. For more information, please visit http://www.t-mobile.com or join the conversation on Twitter using $TMUS. The earnings call will be broadcast live via the Company's Investor Relations website at http://investor.t-mobile.com. A replay of the earnings call will be available for two weeks starting shortly after the call concludes and can be accessed by dialing 888-203-1112 (toll free) or 719-457-0820 (international). The passcode required to listen to the replay is 8628938. This news release includes "forward-looking statements" within the meaning of the U.S. federal securities laws. Any statements made herein that are not statements of historical fact, including statements about T-Mobile US, Inc.'s plans, outlook, beliefs, opinions, projections, guidance, strategy, expected network modernization and other advancements, are forward-looking statements. Generally, forward-looking statements may be identified by words such as "anticipate," "expect," "suggests," "plan," “project,” "believe," "intend," "estimates," "targets," "views," "may," "will," "forecast," and other similar expressions. The forward-looking statements speak only as of the date made, are based on current assumptions and expectations, and involve a number of risks and uncertainties. Important factors that could affect future results and cause those results to differ materially from those expressed in the forward-looking statements include, among others, the following: our ability to compete in the highly competitive U.S. wireless telecommunications industry; adverse conditions in the U.S. and international economies and markets; significant capital commitments and the capital expenditures required to effect our business plan; our ability to adapt to future changes in technology, enhance existing offerings, and introduce new offerings to address customers' changing demands; changes in legal and regulatory requirements, including any change or increase in restrictions on our ability to operate our network; our ability to successfully maintain and improve our network, and the possibility of incurring additional costs in doing so; major equipment failures; severe weather conditions or other force majeure events; and other risks described in our filings with the Securities and Exchange Commission, including those described in our most recently filed Annual Report on Form 10-K. You should not place undue reliance on these forward-looking statements. We do not undertake to update forward-looking statements, whether as a result of new information, future events or otherwise, except as required by law. This Press Release includes non-GAAP financial measures. The non-GAAP financial measures should be considered in addition to, but not as a substitute for, the information provided in accordance with GAAP. Reconciliations for the non-GAAP financial measures to the most directly comparable GAAP financial measures are provided below. T-Mobile is not able to forecast net income on a forward looking basis without unreasonable efforts due to the high variability and difficulty in predicting certain items that affect GAAP net income including, but not limited to, income tax expense, stock based compensation expense, interest expense and interest income. Stock-based compensation includes payroll tax impacts and may not agree to stock based compensation expense in the condensed consolidated financial statements. Adjusted EBITDA - Earnings before interest expense, net of interest income, income tax expense, depreciation and amortization expense, non-cash stock-based compensation and certain expenses not reflective of T-Mobile's ongoing operating performance. Adjusted EBITDA margin represents Adjusted EBITDA divided by service revenues. Adjusted EBITDA is a non-GAAP financial measure utilized by T-Mobile's management to monitor the financial performance of its operations. T-Mobile uses Adjusted EBITDA internally as a metric to evaluate and compensate its personnel and management for their performance, and as a benchmark to evaluate T-Mobile's operating performance in comparison to its competitors. Management believes analysts and investors use Adjusted EBITDA as a supplemental measure to evaluate overall operating performance and facilitate comparisons with other wireless communications companies because it is indicative of T-Mobile's ongoing operating performance and trends by excluding the impact of interest expense from financing, non-cash depreciation and amortization from capital investments as well as non-cash stock-based compensation and certain other nonrecurring expenses. Adjusted EBITDA has limitations as an analytical tool and should not be considered in isolation or as a substitute for income from operations, net income, or any other measure of financial performance reported in accordance with GAAP. Long-term debt as of March 31, 2015 through December 31, 2015 has been restated for the adoption of Accounting Standards Update 2015-03, “Simplifying the Presentation of Debt Issuance Costs” in the first quarter of 2016. The impact to the Net Debt (excluding Tower Obligations) to Last Twelve Months Adjusted EBITDA Ratio was not significant. Net debt - Short-term debt, long-term debt to affiliates, and long-term debt (excluding tower obligations), less cash and cash equivalents and short-term investments. Free Cash Flow - Net cash provided by operating activities less cash capital expenditures for property and equipment. Free Cash Flow is utilized by T-Mobile's management, investors, and analysts to evaluate cash available to pay debt and provide further investment in the business. Adjusted Free Cash Flow - Free Cash Flow excluding decommissioning payments related to the shutdown of the CDMA portion of the MetroPCS network. Average Revenue Per User (ARPU) - Average monthly service revenue earned from customers. Service revenues for the specified period divided by the average customers during the period, further divided by the number of months in the period. Branded postpaid phone ARPU excludes mobile broadband customers and related revenues. Average Billings per User (ABPU) - Average monthly branded postpaid service revenue earned from customers plus monthly EIP billings and lease revenues divided by the average branded postpaid customers during the period, further divided by the number of months in the period. 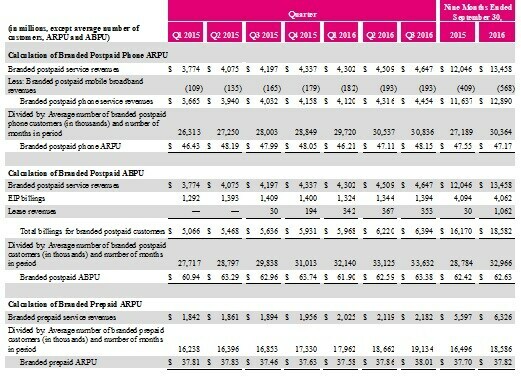 T-Mobile believes branded postpaid ABPU is indicative of estimated cash collections, including device financing payments, from T-Mobile's postpaid customers each month.